“the senior adviser for digital media at the White House, Mark DeLoura, says Barack Obama has taken a personal interest in games and gaming culture. “I wouldn’t have this job if he wasn’t interested,” said DeLoura on stage at the GamesBeat 2013 conference. DeLoura is a veteran gamer who has held senior leadership positions at Google, Sony, Nintendo, and others. He’s been working at the White House for seven months, which he describes as a far more formal environment than Silicon Valley. According to DeLoura, it hasn’t been easy task to recruit austere government officials for a gaming session. But DeLoura is dead-set on getting a group together to play Civilization once a week. “I point out that they are playing Candy Crush,” he said. Joking aside, the president is deeply concerned with improving education in our country. Games are an essential part of the conversation and strategy. 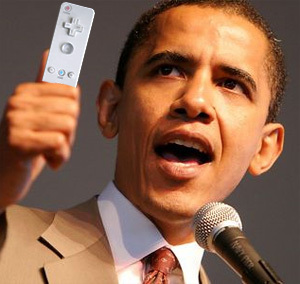 “I want you guys to be stuck on a video game that’s teaching you something other than just blowing something up,” Obama said at a press conference in in 2011, a few years before the Department of Education launched a grant for the country’s most talented educational gamers. DeLoura helped write the blog post announcing the initiative. “He [Obama] wants to see Sasha and Malia playing a game that teaches them something,” DeLoura told me. In a 1-on-1 interview after his GamesBeat talk, he told me that the president’s daughters love to dance and play games that help them stay active — like Just Dance. In recent months, DeLoura and his team have been researching how game dynamics can be applied to education. Can a game help kids learn new languages, make friends, or pickup technical skills? DeLoura doesn’t believe that the tech industry has done nearly enough to support educational gaming, with a few exceptions. A few Silicon Valley investment firms focus on educational games, and Bill and Melinda Gates have been making large investments through their foundation. One of DeLoura’s passion projects is to make it easier for parents and teachers to find great games and apps for kids at any age. He hopes that parents won’t dismiss all games, as a result of a few bad apples. “This is a real problem we need to tackle,” he said. 1. DragonBox, a multiplatform math game. 2. Reach for the Sun from Filament Games, a plant life-cycle sim. 3. Minecraft, the indie building game sensation. DeLoura and the Obama administration are currently developing new programs to bolster coding education in schools. Games can certainly play a role — particularly those that teach young people to code. Schools can adopt these games to support their coding curriculum. DeLoura points to a program in the U.K. called “computing,” which teaches digital skills to kids as young as 5.